Veloposters came to being in 2013 after a gift of a one off framed print was created to congratulate a mate for completing 3 Peaks. It was a lightbulb moment. 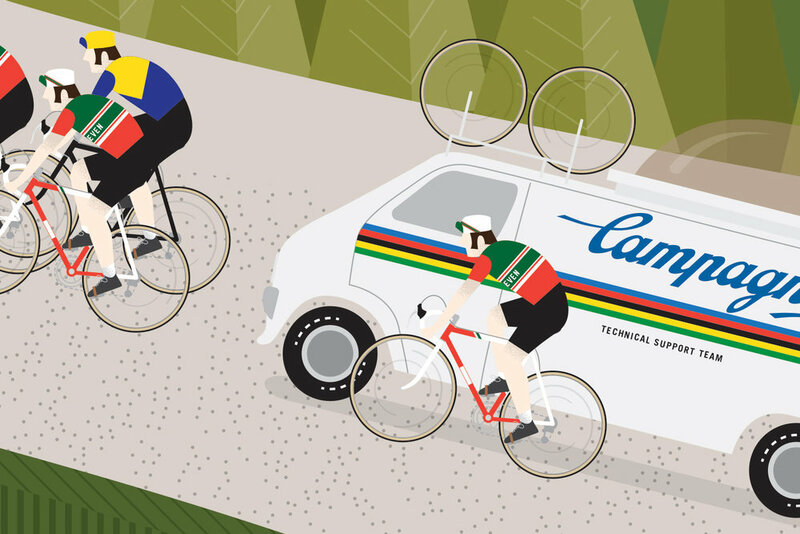 The print was so well received, I figured there was something in it - and with a gap in the market locally, veloposters was born. Veloposters specialise in creating simple, modern and distinct cycling prints. Veloposters was started by Simon Telfer a graphic designer by trade, to pedal (see what I did there) his prints to the cycling public. If you have any ideas on future prints, shoot us an email. The prints are high-quality, locally-printed, hand-signed giclée art prints. Beautiful, 230gsm archival smooth white paper has been chosen for its super smooth texture and ultimate white colour. It has a lovely smooth feel, and holds colour extremely well. This stock is suitable for framing and should provide a lifetime of love. The limited edition series consist of 3 or 4 (A3) themed posters, released monthly and limited to 25 giclée prints per poster. Each poster is hand numbered and signed. These bad boys are killer, and once they are gone, they are GONE! The premium Veloposters are unique designs, you won't find as part of a series. The premium posters are also short run giclée prints of only 50. I do offer larger sized A2 prints. These are limited to 5 prints only! If the option is not there, get in touch, we can make it work! Want something just for you?? Yes, we custom design posters to order. So if you run a cycling event and want something a little different, you are a cycling club, or just after a killer gift for a cycling nut, we would love to help. There's more information in the FAQs section on the site or just shoot us an email. Please note: These prints are not sold matted or framed. They will be carefully sealed in a shipping tube. If you have any questions get in touch. The A3 prints also fit into the 40x50cm Ribba Frames from Ikea, the A2 in the 50x70cm frames, or you can have them framed yourself. Note: You will lose some of the top under the matting in the Ribba frame . If you would like to get in touch about commissions, freelance work, the prints or if you just have a question, shoot me an email. Will be in touch ASAP.